Are you bored? Are you in the mood for something completely new? Whether or not you have any experience with polymer clay, I can't imagine that Julie Picarello's new book, Patterns in Polymer , won't excite you! this book has the kind of cover that makes you go, Whoa! How did she do that?? Well, Julie wants to show you exactly how. Patterns in Polymer launches right into an explanation of Mokume Gane and how the techniques can be applied to polymer clay...much easier than with metal, I do believe! Starting with a stack of colored layers Julie will teach you how to imprint the stacks of clay for maximum color impact, slice off layers for unexpected pattern treats, make beads and pendants from the gorgeous layers, and put them together into truly unique projects. There is an excellent section in the beginning with the basics of working with polymer clay, including a section on color blending that will have you mixing like a pro. Tell me that you don't want to learn to make fabulous one-of-a-kind beads, cabochons, and pendants like these! 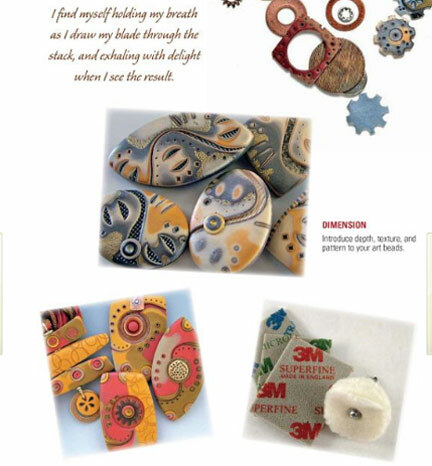 Patterns in Polymer is published by Kalmbach Books, a leader in all things beading! Those look wonderful. I just started with Polymer clay and that looks very interesting. I have the book and love it! I have not been able to duplicate the look yet though. It takes some practice but polymer is not expensive and you can always use the mess if you mess it up as scrap clay or a new color!